Are You Looking For a Motor Vehicle Department Hearing Attorney in Scottsdale? was the test was valid and reliable. There are a number of defenses to an Administrative Per Se suspension, including 1) the officer did not have reasonable grounds to believe that the driver was under the influence; 2) the officer failed to place the driver under arrest; 3) the blood alcohol content is below 0.08%; and 4) the test was unreliable. If the suspension is found valid, the 90 days suspension does allow for a restricted license after the first 30 days under certain conditions. These conditions are: 1) no serious physical injury to another person due to the driving conduct; 2) no prior DUI offense within the prior 84 months; and 3) there was no refusal to take a chemical test for a DUI within the prior 84 months. The restricted license will allow driving between home and employment; for employment; between home or employment and school; between home or employment and a probation office; between home or employment and a doctor's office; and between home or employment and a treatment facility for alcohol or drug screening¸ education or treatment. Lastly, in order to qualify for the restricted license, the driver must complete an alcohol or drug screening prior to obtaining the restricted license. and whether the driver was made aware of the consequences of the refusal. There are a number of defenses to an implied consent suspension, including 1) the officer did not have reasonable grounds to believe that the driver was under the influence; 2) the officer failed to place the driver under arrest; 3) the officer failed to properly explain the result of a refusal; 4) the driver was unconscious and not capable to refuse; 5) the driver timely recants an earlier refusal; 6) law enforcement collected an insufficient sample from the cooperating driver who was not engaging in any gamesmanship; and 7) refusal was based on something else not required for completing the test, such as refusing to sign a liability waiver for the blood draw. If the refusal is found valid, the privilege to drive will be suspended for a period of one full year, or for a period of two full years if this was a second refusal within a period of 84 months. If given the one year suspension, as described above, the driver may apply to the MVD for a "Special Ignition Interlock Restricted Driver License" (SIIRDL) after completing as least 90 days of that suspension. If eligible, an ignition interlock device (a breath test instrument) must be installed in any driven vehicle for the remaining term of the suspension. the driver is 18, 19 or 20 years of age, convicted of Underage Drinking and Driving and the Court orders MVD to issue SIIRDL. If MVD grants the application for a SIIRDL, the driving privilege will be restricted and the driver will be required to have an SR-22 insurance policy. The restricted license will allow driving between home and employment; for employment; between home or employment and school; between home or employment and a probation office; between home or employment and a doctor's office; and between home or employment and a treatment facility for alcohol or drug screening¸ education or treatment. If the driver received a revocation as a result of a second DUI conviction within an 84 month period or a felony DUI. The SR-22 insurance must be held for a period of 3 years. MVD issues, as well as DUIs, are very serious matters. Your ability to get around on your own is at risk. Robert can help you through the crisis. Robert personally answers his own telephone and he will personally handle your case. 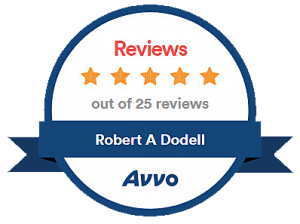 Contact Robert A. Dodell, Attorney at Law, directly by email or by calling 480.860.4321 now for a free initial consultation.